Ever wonder what happens at camp in those months between the end of winter and the start of those sunny, warm, spring days? Well, here in the North Country we say we have four seasons: Fall, Winter, Mud and Summer! This year we had a whole lot of winter – -so much so that March didn’t come in like a lion, it came in like a saber tooth tiger and stuck around! But we just ignore the weather and look at the calendar – -it said “Spring,” so we decided to do just what we’d do in summer and fall. This past month we went on two hikes that are familiar to you returning campers and exciting destinations for those new to camp: nearby Hadley Mountain and Cascade Mountain in the High Peaks. In the summer, Hadley is a modest hike up a not-so-steep trail to a fire tower atop a rocky summit. Our trip was just like that, except for the fact that we had to hike up a snowy trail, and that it was so cold and windy that we passed on climbing up in the fire tower and scurried right back down after a few minutes! Now, many of you have been to the top of Cascade, one of the 46 4,000+ foot High Peaks. 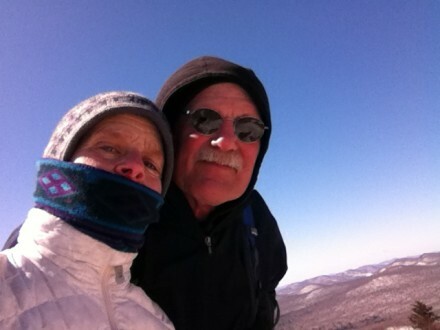 We packed our winter gear anticipating that we’d need to snowshoe up to the top. 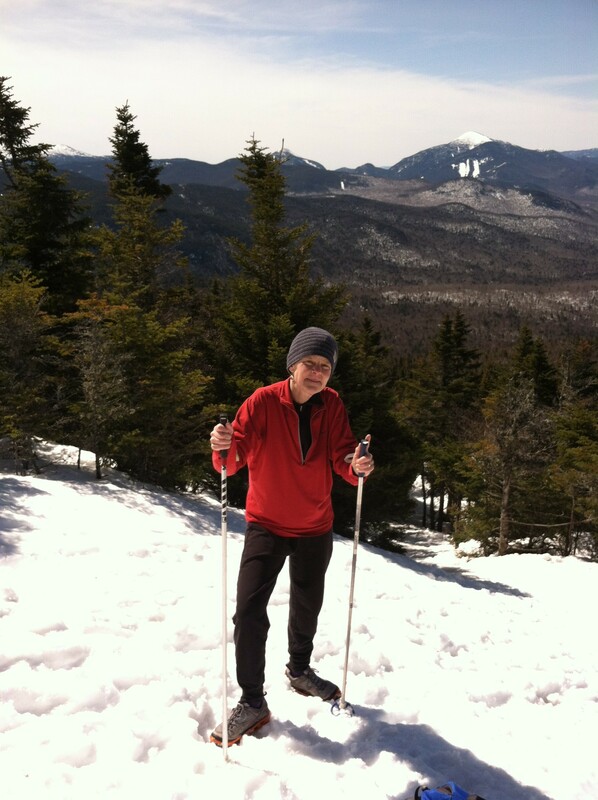 What we didn’t anticipate was that the trail was too hard packed to snowshoe, or that it would be over sixty degrees! Just like at camp, you need to be flexible and adaptable. So we traded our snow shoes for crampons (they are kind of like metal “teeth” in a harness you attach to your hiking boots) and scooted right up the trail in t-shirts!!! It’s not like summer hiking , where you have to navigate rocks and boulders. Instead, your crampons bite the snow and ice and you scamper right up a snowy highway! It was amazing to be on top of three feet of snow while wearing a t shirt and backpack. And the view from the top of Cascade is even more incredible in the clear cold air! 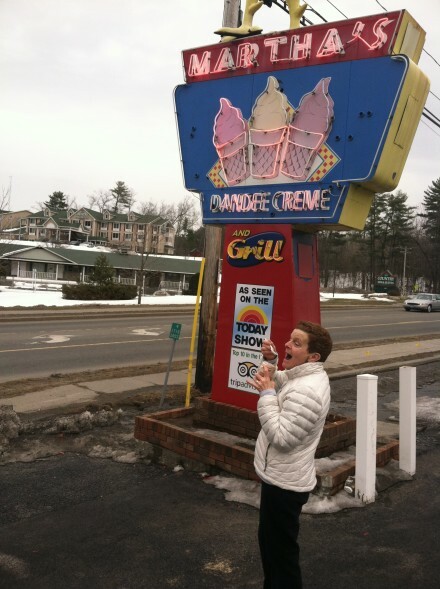 But no matter what the weather or calendar, there’s one date on which Spring officially begins around here – -the opening of Martha’s Soft Ice Cream. Those staff and campers who have been there know it is the best soft ice cream in the world, even if you have to eat it sitting on a very large snowbank. The ice finally left Echo Lake around the 25th of April this year. There are still a few patches of snow in the woods, but things are waking up and warming up. We can’t wait to see all of you!